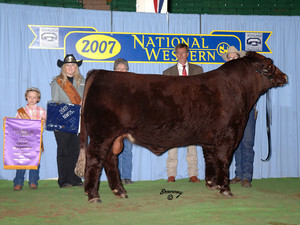 ROBINHOOD is the 2007 National Champion Optimizer Composite Bull. As an 87.5% bull, he was exhibited in the Composite division of the show where he was widely admired for his outstanding thickness and volume, square hip and attractive structure and style. We believe that great herdsires come from great cow families and ROBINHOOD has maternal power backing him up for generations. His mother is an ASA Silver Dam who has an average weaning ratio of 105 on 3 calves along with an average yearling ratio of 108. She is also the grandmother of the $6000 MAC RAGTIME 80R, a top seller of our 2006 sale. His grandmother has an average weaning ratio of 103 on 5 calves and is also the dam of the $8500 MAC REDROCK 132R who is featured in this directory. His great grandmother has an average weaning ratio of 107 on 9 calves and his great great grandmother retired with an average weaning ratio of 110 on 14 calves.